October 23, Mt. Laurel, NJ: Dynamite Entertainment announces a Kickstarter campaign for the first-ever resin statue for the Pathfinder Roleplaying Game. The publisher continues their strong partnership with gaming leader Paizo Inc. following years of expanding the lore of the game’s world. Backers can preorder their copies of the limited-edition statue and bundle in a range of extras currently available only through the Kickstarter. “We've been creating great Pathfinder comics with Paizo over the last half-decade, but today, I’m immensely excited to announce the expansion of that partnership, starting with our first Pathfinder statue of Seoni,” shared Nick Barrucci, Dynamite Publisher/CEO. “We worked hand-in-hand with our friends at Paizo to create this beautiful startue, and to add so many cool collectibles and comics at different pledge levels. I have no doubt the fans will enjoy this beautiful piece." “It’s been a joy working with Nick and the team at Dynamite to bring Seoni to life,” said Erik Mona, Paizo’s Publisher and Chief Creative Officer. 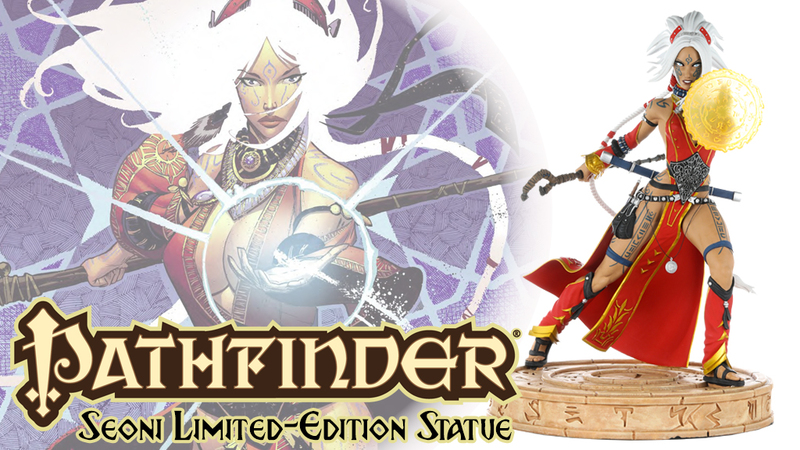 “The attention to detail we’ve seen as they’ve produced the comic line is mirrored in the production values of the statue, and we’re excited to see these made available to Pathfinder players.